Bruce Nauman is an artist who works in a variety of media including sculpture, photography and performance. He made a video of a performance called Dance or Exercise on the Perimeter of a Square. For this work, he explored his surroundings in space through his own body, moving around the edges of a square marked out on the floor. He moved to the sounds of a metronome and made repetitive movements which went on for hours. Using the tape, mark out squares of about one meter for each person taking part. Decide in what order you will take turns to be the 'exercise leader'. Everyone should have a turn. The exercise leader has the responsibility to call out the actions and lead the activities. The leader also has to time-keep. Each action should go on for at least 3 minutes. Start the music or metronome if you are using accompanying sound and begin. The following sequence of actions was created by Ben. 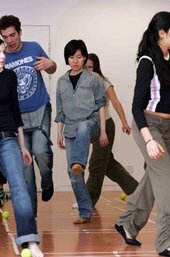 First action: Bouncing the ball: Bounce the ball in your square until the leader says stop. Second action: Walking the Square: Explore the four corners of your square, moving around its perimeter. Exaggerate your actions. Continue until you are told to stop. 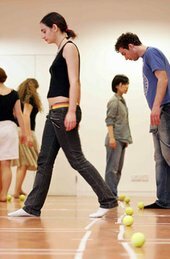 Third action: Exaggerated Walking: Break out of your square – use your whole body to walk, swing your legs high, crouch down low, and move in weird ways around the room. Continue until you are told to stop. 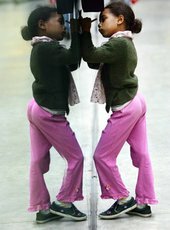 Think of other ways of exploring the square with your body and then think about ways of exploring the room you are in. Try pitting stickers on parts of your bodies and move around the room with these stickers touching the wall at all times! Change the leader over so that everyone gets a turn. Make sure the tape does not leave messy marks on the floor. Get permission if you need to. Try exploring the imaginary cube formed by the base of your square on the floor. Try exploring it with all parts of your body when you are standing, sitting and lying down. Change the size of your imaginary cube and try again. What is it like to be inside a huge cube and what is it like to be cramped a tiny one? Try coming back to this activity a second time when you have had time to reflect on your experience and think about other ways in which you could move.